Press Play to view a video of our unique, patented, rear container lifter. We generally hold stocks of new and used 20 foot and 40 foot shipping containers and a variety of other specialty containers in each State capital city and in some regional centres across Australia. If we do not have what you are looking for in your location, chances are that we can get it to you within just a few days. 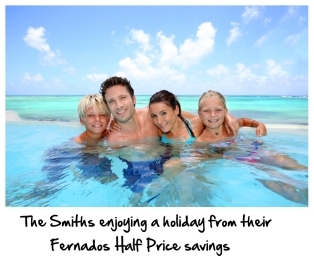 So do not hesitate to call us to discuss your needs. Container Dimensions - Shipping container dimensions are generally expressed internationally in feet and inches (imperial measurements). See our General Info. page for all basic container dimensions in both imperial and metric measurements. Are generally available in new and used 40 foot and 20 foot sizes and as refurbished 10 foot units. These are the most commonly available containers. 10 foot containers are not generally manufactured as new units. They are usually cut down and refurbished 20 foot or 40 foot containers and are made to order as required. There is a significant cost to convert larger containers into 10 foot containers and together with the fact that they are fully refurbished to A grade condition when converted, they are usually more expensive to buy than a normal A grade used 20 or 40 foot container. General purpose containers are 8 feet 6 inches high and are not quite two (2) standard pallets wide inside. Are generally available in the same lengths as general purpose containers (above) but are are 12 inches (30cm) taller. They are also often made slightly wider so as to accommodate two standard pallets side by side. We offer a simple container storage solution where we can leave a container at your house for you to load. We will then take it to one of our storage facilities near you. You can leave your items secure in the knowledge that they are safe. When you are ready for your belongings we can deliver the container to your nominated address anywhere in the world for you to unload. Shipping containers can be made or modified to specifications that suit almost any reasonable use. They can be made to provide living accomodation, office units, self storage units, amenities blocks, contain tanks to transport fuels and other liquids, house generators and other machinery, transport bulk grain, have open tops for high loads, have side doors, doors at each end, etc etc. 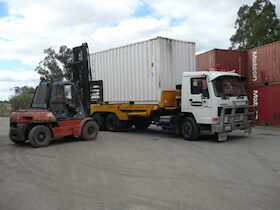 In short, shipping containers can generally be made longer, shorter, wider or higher to accomodate any reasonable use. We do our best to avoid the industry jargon. For example, you may have heard people describe containers as A grade or B grade etc. Those terms are rarely explained by the person who is using them. They also often mean different things to different people. These terms are therefore, in reality, fairly meaningless. Ideally, an A grade container should mean a container that is reasonably new but which may still have two or three professional repairs. 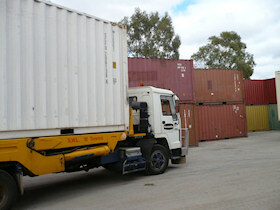 B grade containers may be 8 to 12 years old and may have more than three professional repairs. Both A grade and B grade containers should be reasonably presentable and should be guaranteed as weather proof with good doors and good door seals. It is important to note that all containers, including new ones, can arrive with marks or scrapes on them.